The NEBNext® Microbiome DNA Enrichment Kit facilitates enrichment of microbial DNA from samples containing methylated host DNA (including human), by selective binding and removal of the CpG-methylated host DNA. Importantly, microbial diversity remains intact after enrichment. In human DNA, 4–6% of cytosines are methylated, and 60–90% of these methylated cytosines are at CpG sites (1,2). In contrast, methylation at CpG sites in microbial species is rare. 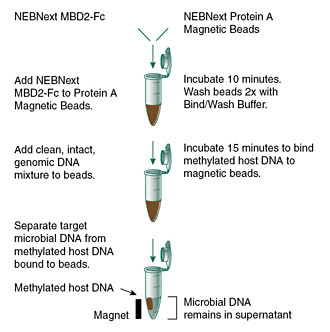 The NEBNext Microbiome DNA Enrichment Kit uses a simple and fast magnetic bead-based method to selectively bind and remove CpG-methylated host DNA. The method uses the MBD2-Fc protein, which is composed of the methylated CpG-specific binding protein MBD2, fused to the Fc fragment of human IgG. The Fc fragment binds readily to Protein A, enabling effective attachment to Protein A-bound magnetic beads. The MBD2 domain of this protein binds specifically and tightly to CpG methylated DNA. Application of a magnetic field then pulls out the CpG-methylated (eukaryotic) DNA, leaving the non-CpG-methylated (microbial) DNA in the supernatant (3). If desired, the host DNA captured in the magnetic bead pellet can be eluted, and a protocol is provided for this. The NEBNext Microbiome DNA Enrichment Kit is suitable for a wide range of sample types, including samples with high levels of contaminating host DNA, (3,4) and is also effective for separation of organelle DNA (e.g. mitochondria, chloroplast) from eukaryote nuclear DNA (5). The kit is compatible with downstream applications including next generation sequencing on all platforms, qPCR and end-point PCR. DNA was purified from pooled human saliva DNA (Innovative Research) and enriched using the NEBNext Microbiome DNA Enrichment Kit. Libraries were prepared from unenriched and enriched samples and sequenced on the SOLiD 4 platform. The graph shows percentages of 500M-537M SOLiD4 50bp reads that mapped to either the Human reference sequence (hg19) or to a microbe listed in Human Oral Microbiome Database (HOMD). (Because the HOMD collection is not comprehensive, ~80% of reads in the enriched samples do not map to either database.) Reads were mapped using Bowtie 0.12.7 with typical settings (2 mismatches in a 28 bp seed region, etc.). DNA was purified from pooled human saliva DNA (Innovative Research) and enriched using the NEBNext Microbiome DNA Enrichment Kit. Libraries were prepared from unenriched and enriched samples, followed by sequencing on the SOLiD 4 platform. The graph shows a comparison between relative abundance of each bacterial species listed in HOMD before and after enrichment with the NEBNext Microbiome DNA Enrichment Kit. Abundance is inferred from the number of reads mapping to each species as a percentage of all reads mapping to HOMD. High concordance continues even to very low abundance species (inset). We compared 501M 50bp SOliD4 reads in the enriched dataset to 537M 50bp SOLiD4 reads in the unenriched dataset. Reads were mapped using Bowtie 0.12.7 with typical settings (2 mismatches in a 28bp seed region, etc). Each kit contains sufficient reagents for the effective separation of CpG methylated DNA from a mixed pool containing microbial or viral DNA. If starting with 1 μg of input DNA per experiment, the volumes provided are sufficient for preparations of up to 6 reactions (NEB #E2612S) and 24 reactions (NEB #E2612L). All reactions should be stored at -20°. Box 1: Store at -20°C. Box 2: Store at 4°C. Do not freeze. Lister, et al. (2009). Nature. 462, 315-322. Tucker, K.L. (2001). Neuron. 30, 649-652. Yigit, E. et al. (2014). Appl. Plant Sci. 2 (11), 1400064. Can I incubate the DNA input sample with the MBD2-Fc-bound beads for a longer period of time? How important is the MBD2-Fc bead to DNA ratio? What is the maximum volume of input DNA that I can use per reaction? Will the procedure work on degraded DNA? What is the best method for purifying the DNA after the enrichment? 5. Thomas, T. (2017) NEBNext Human Microbiome DNA Enrichment Kit Scientific Reports; (7), 2045-2322. This product and its use is the subject of one or more issued and/or pending U.S. and foreign patent applications owned by SEQUENOM, Inc. The purchase of this product from NEB or its authorized distributors conveys to the buyer the non-tranferable right to use the purchased amount of the product and components of the product in research conducted by the buyer (whether the buyer is an academic or for profit entity). The purchase of this product does not convey a license under any method claims in the foregoing patents or patent applications directed to producing the product. The buyer cannot sell or otherwise transfer this product or its components to a third party or otherwise use the product for the following COMMERCIAL PURPOSES: (1) use of the product or its components in manufacturing; (2) use of the product or its components for therapeutic, diagnostic or prophylactic purposes in humans or animals; or (3) resale of the product or its components, whether or not such product or its components are resold for use in research. ACCEPTANCE OF THE FOREGOING LIMITED USE PROVISIONS: If the purchaser is not willing to accept the limitations of this limited use statement, NEB is willing to accept return of the product with a full refund. For information on purchasing a license to use this product for purposes other than those permitted above, contact the NEB Licensing Department at [email protected]. The MBD-Fc technology is licensed exclusively to New England Biolabs, Inc. from Sequenom, Inc.
QIAGEN® is a registered trademark of The Qiagen Group. ION TORRENT™ and SOLID™ are trademarks of Life Technologies, Inc.